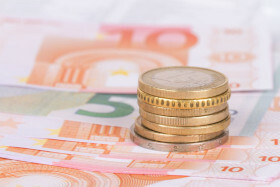 The euro today rallied almost to 3-week highs against the US dollar in move that is likely to see it post its first weekly gain following three consecutive weekly drops. The EUR/USD currency pair today rallied higher driven by a shift in investor risk appetite, which saw markets bid up riskier assets such as stocks, while fleeing safe haven assets. The EUR/USD currency pair today rallied to a high of 1.1324, which was last hit on March 22 having risen from an opening low of 1.1257 before retracing some of its gains. The currency pair opened today’s session with a bullish bias driven by a weak greenback following yesterday’s dovish comments by Fed Chair Jerome Powell. The risk-on investor sentiment, which pushed the pair higher, was also reflected in the rally by European stocks and US stock futures in the European session as US bonds also posted gains. The pair’s rally was further boosted by the positive eurozone industrial production data released by Eurostat. The industrial production print came in at -0.2% versus the expected -0.6%, which boosted investor appetite for the pair. The pair’s rally was further boosted by the weak greenback as tracked by the US Dollar Index, which hit a low of 96.75. The pair was also boosted by the weak University of Michigan consumer sentiment survey for April, which came in below expectations. The currency pair’s future performance is likely to be influenced by geopolitical events over the weekend. The EUR/USD currency pair was trading at 1.1295 as at 17:24 GMT having risen from a low of 1.1257. The EUR/JPY currency pair was trading at 126.52 having rallied from a low of 125.66.